During a tour of Sierra Leone I met Mr. Augustine B.S. Conteh the Mayor of village “Mambo”. He was working on the Guma Dam Project. This is a natural water reservoir that supplies Freetown, the capital of Sierra Leone with water. In the course of our very first contact he asked me whether I could find sponsors who could help him build a school and a small Hospital in his village. He sparked my interest and I accepted his invitation to visit his village. I thought over this project for some time and then I assured the mayor that I would be willing to help him build a school in his village. After my holiday in Sierra Leone I returned to Germany and started to inquire about the formalities needed to establish and register a charitable organisation. 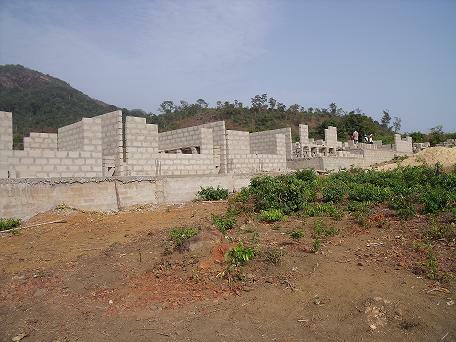 My aim was not only to build a school for the village “Mambo” but also to construct a small medical care unit for the village. Medical care in Mambo and the surrounding villages is very bad and a ‘Hospital’ would be a major gain for the village residents as well as for the neighbouring communities. End of September I revisited Sierra Leone and the village of Mambo. The main reason was to discuss with the Mayor my plans regarding building a school in Mambo. 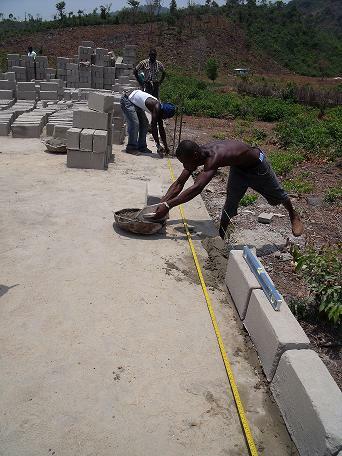 End of October when I left Sierra Leone the first blocks for the school foundation were ready. During my absence not only the Mayor but also Pastor Edmund Sawyer and Mr. John M. Sesay inspected and watched over the construction work on the school. Of course I was very curious to know how much progress would take place during my absence - that is till February 2009. 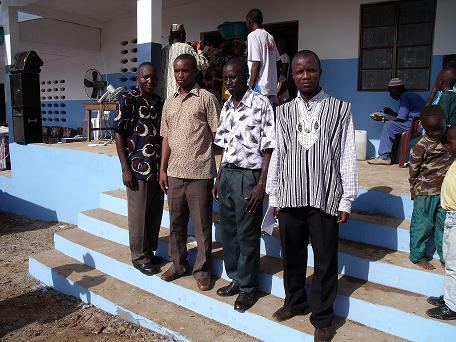 It was our common goal to inaugurate the school in September 2009. The month when new school terms start. When I returned to Mambo in February 2009 my mood dropped to point zero. 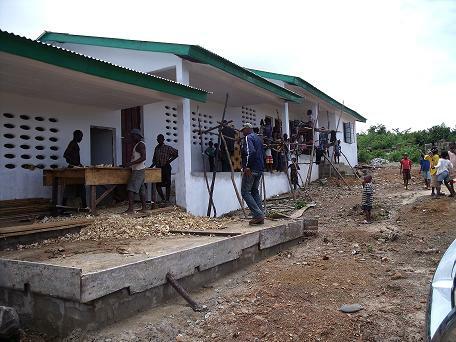 Not even the foundation of the school was completed. The village children however were most excited that they would soon have a school of their own. They immediately posed in front of their new school building for a group photograph. After several discussions we were able to solve the problems that had arisen during my absence and which had led to the delay in the construction work. Finally the workers could continue with construction. In no time the foundation was completed. The parallel blocks required for the putting up of the wall were also manufactured. 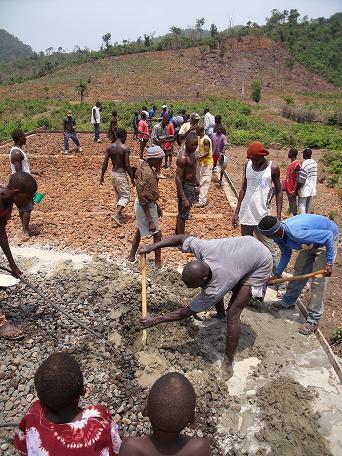 Laboriously sand, cement and water were carefully mixed so that the mass was neither too hard nor too soft. The mixture was then poured into a mould and firmly pounded down with a wooden plank. These blocks were then laid in the sun to dry. After two or three days they were sprinkled with water and left to dry for another eight days. End of March 2010 the masonry work began. I kept wondering whether the construction work on the school would be finished in time. I was fully aware that the rainy season would soon start. This would further delay construction work. The manager in charge of construction Mr. Christo began with the construction of the walls. After four days the outline of the school building was visible. My stay in Sierra Leone was gradually coming to an end and I had to fly back to Germany. My hope that we could have the inauguration of the school as planned began to grow once again. I wished everyone good luck and promised to return to Mambo by the end of August. I really did not want to miss the opening of the new school. In Germany however, I had a lot to see to regarding the formalities involved in registering a charitable organisation. Umpteen formalities have to be taken into consideration. Finally after much effort I was able to successfully complete all the formalities and early July I was able to register out organisation. It was now time to concentrate on the furniture required for the school. How was I to arrange for school furniture at such short notice. School holidays were soon to start. Mrs Sonja Grimm the co-founder of out organisation had the idea of asking her son who is a teacher in a secondary school whether their school had old furniture to donate. To out luck the school had furniture stacked away and agreed to donate black boards and chairs. Back in Lonsee I approached our Mayor and he too agreed to donate desks and chairs. We also received help from a neighbouring village. I ordered for a container and mid August the container was loaded and immediately sent to Hamburg for onward journey to Sierra Leone. I was keen that the container arrived in Sierra Leone before the 9th of September. In the last week of August I flew back to Sierra Leone. I wanted to have enough time till the container arrived - and of course I was also curious to know how much progress the school had made. Upon my arrival in Mambo I was quite surprised. The building was completed but there was still much to do. The school was to open o the 14th of September, and the school inauguration ceremony was set for the 18th of September. In Africa it is very much the same as in Germany. In Africa too one is not too punctual about dates. After three exhausting weeks we were finally attending to the last jobs before the big inauguration day. With a delay of only two weeks we were able to celebrate the inauguration of the school. The minister for education, the district administrator and even a representative of the president of Sierra Leone were present. All those who attended the inauguration ceremony were very impressed by the beautiful school of Mambo. Regular school activities started on the following Monday. For our organisation it was not just handing over a beautiful school to the village community - it was far more than that. We were handing over a school with special characteristics. We were enabling the poorest of the children an education equal to that of a private international school. We have employed highly qualified teachers, our classes have not more than 25 children and above all we charge a very nominal fee. Just three Euros per year. Our teachers are motivated and come to school full of joy. In a state run school the strength of a class lies between 50 - 100 children.. The teachers are not well educated. The school fees lie between 15 - 20 Euros per year. In a private school the strength of the classes are small. However, the teachers are not very motivated as their pay is irregular. This was our experience with an aptitude test done during school admissions. Children who were in the second standard or even those in the third standard could neither read nor write. Our organisation now has a new challenge. The children need a good foundation - and that begins with nursery education. 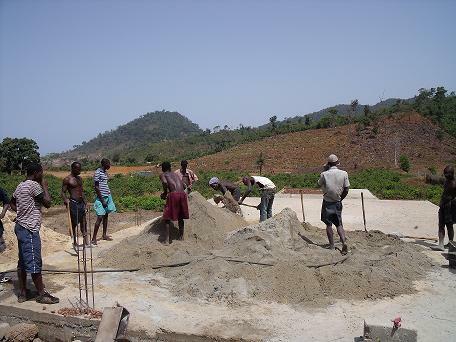 Therefore, construction work has started for a new building for a nursery school. The next assignment was to concentrate all my efforts on the sourcing of the urgent needed school furnitures. The challenge was to find in a short time a school, that was willing to bestow old school furnitures for our goal. We were already in the last school week before the summer holidays were going to start in Baden-Württemberg. The salvating idea came from association co-finder Sonja Grimm. Her proposal was to ask her son for school furniture, that is a teacher on the „Lichtentaler“ high school. The school administration agreed without any bureaucratic barriers and supported us in shortest time with blackboards and chairs. I turned to the administration of the high school in Lonsee, were I live. They showed a high interest and helpfulness as well. The major of Lonsee, Mr Ogger bestowed chairs and tables. The container, which should bring all the important shool items to Mambo was orderedfor the second weekend of August. Finally, the container had to arrive in time on September 09th in Sierra Leone. In the last week of August I flew back to Sierra Leone. I would had enough time before the container was going to arrive. And, of course, I was very excited about the progress of the school construction. Arriving in Mambo, I was very surprised – the school building was finished, but there were many things to do fort he school opening. On September 14th, the school was supposed to start and the opening ceremony was planned for September, 18th. After stressful three weeks, the most work to do was finished. With only two weeks delay, we could celebrate the desired opening of our school. The Secretary of Education, the district administrator and the even a representative of the president of Sierra Leone came to the opening ceremony. All attendees were enthusiastic about the new school in Mambo. The school could start already on the following Monday. The goal of WAMAGRISO e.V. 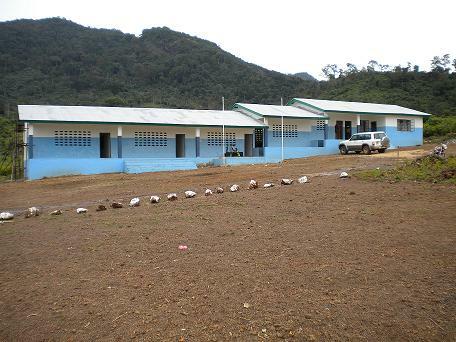 is, not only to give the village Mambo a nice scholl building, but especially a school for children of the poorest families to enable them to get a good education on the level of a private, internatial school. High qualified teachers, small classes (not more than 25 students in one class) and the low school fee of 3,- € per year shall give the children of the poorer families the base of a more promising futur. Our teachers are highly motivated every day compared to the teachers of a governmental controlled school. The classed of the governmental controlled schools are partly filled with 50 to 100 students. The teachers themselves do nothave a good education and the school fee is 15,- € to 20,- € per year. The private controlled schools do have smaller classed, but the teachers are not that motivated, because the salary is not always garantueed. A qualifying test showed us the effect of the governmental or private scholl eduaction. Students of the second or third grade weren`t able to read or write. The next challenge was shown to WAMAGRISO e.V. – the children do need a good base before the school starts – a kindergarten. The plan fort he kindergarten building is already finished and the work is already in process.